STEPHEN K. HENN is President of SmartPros Legal & Ethics, Ltd. He is an experienced consultant, executive, and attorney with over fifteen years as a pioneer and leader in legal and ethics training for lawyers and executives. He has been an instructor for several live and Web-based legal and ethics programs. Prior to SmartPros Legal & Ethics, Henn was president and CEO of Cognistar Interactive Corporation, a leader in Web-based continuing legal education and executive ethics and compliance training. Case Study: A CFO’s Dilemma. CHAPTER 2 Why Are Ethics Critical? 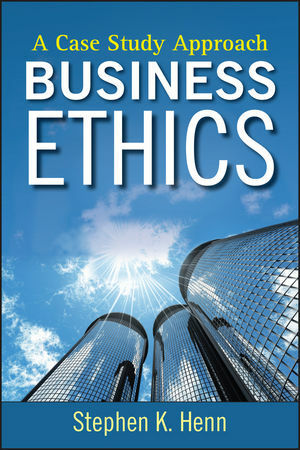 CHAPTER 3 Why ‘‘Business’’ Ethics Is Not Just about Corporations. Case Study: The Duke University Lacrosse Scandal. Case Study: The United Way. CHAPTER 4 A Historical Review. Business Ethics in Times Past. Case Study: Saint Thomas Aquinas. CHAPTER 5 Why Do People Behave Badly? CHAPTER 6 Work Environment and Group Dynamics. Case Study: The Stanford Prison Experiment. Case Study: The Milgram Experiment. Case Study: The Smithsonian Institution. CHAPTER 8 The Common Element—Trust. Case Study: The Tylenol Poisonings. Case Study: Firestone–Ford Tire Recalls. CHAPTER 9 Building an Army of Davids. CHAPTER 10 The Positive Power of Peer Pressure. CHAPTER 11 How to Develop Leadership. Case Study: Whirlpool and Leadership Development. CHAPTER 12 The Logic of William of Ockham. Is It the Means or the Ends? Case Study: University versus Nation. Case Study: Charles Ponzi and His Scheme.